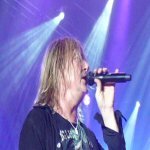 Def Leppard singer Joe Elliott answered some fans questions on 18th July and talked about plans to play another UK tour in 2015. This follows up Joe's (more recent) news from 22nd July that the current plan is to start a world tour around April/May 2015 kicking off in Japan/Australia. Listen to the full 13 minute interview via the link below. Interesting tour part starts at 11:54 mins in. When are you playing Sheffield Arena again? "Obviously when we do a British tour it's the first one that we think of because it's where the band was born. As everybody knows I'm saying this now on the 18th July 2014. We are on tour with KISS which doesn't finish until mid September, well it finishes at the end of August, but we're doing some more shows that keeps us on the road until mid September." "We have an album to finish off which is gonna be our main priority after this tour and when that album's done we shall go on tour and it just depends in which order of the world we go round. So if we hopefully get the album out by April or May we could be playing the arena in May or we may save it for the touring season of September, October, November or so of 2015. So I would say next 14/15 months we will be back in arenas hopefully all over Britain not just Sheffield."